No, this is not a shameless attempt to toot our own horn. While we could take a couple paragraphs to tell you to look no further for a law firm in Burlington to help you with all of your legal needs, the fact is that the team at KCY at LAW are specialists in employment law. So where should you turn if your legal concerns are outside the realm of contracts, terminations, LTD claims and the Employment Standards Act? Our top recommended firms for all of your non-employment law needs are Cambridge LLP and Martin & Hillyer Lawyers. 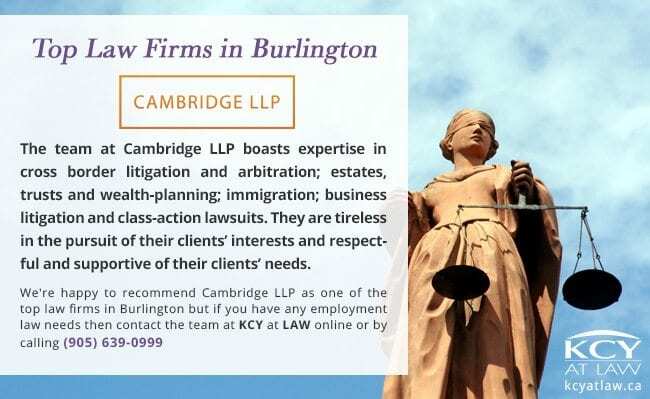 Cambridge LLP’s primary offices are in Burlington and Toronto. The team at Cambridge LLP boasts expertise in cross border litigation and arbitration; estates, trusts and wealth-planning; immigration; business litigation and class-action lawsuits. They are tireless in the pursuit of their clients’ interests and respectful and supportive of their clients’ needs. Martin & Hillyer is Burlington’s largest personal injury law firm. If you have been injured in a car accident, slip & fall, or are the victim of medical malpractice or sexual abuse, they are your team. Additionally, Martin & Hillyer lawyers’ have the expertise to support you through the labyrinth of insurance claims. Thank you for your excellent negotiations and very generous time to reach a severance settlement for me. I truly appreciate your extra efforts on my behalf! You and your law team are outstanding professionals. I learned a great deal from you during this process. I’m very pleased with the positive outcome! And if you like what you read, call us at (905) 639-0999 or reach us online to book your consultation.